If you’re into healthy eating or just love cooking, then you know just how all the cutting, slicing, dicing, and grating can eat up so much of your time. This is where mandoline slicers come to the rescue and change things up. And to make things easier for you, we bring you this recommendation on the best mandoline slicers! With one of them in your kitchen arsenal, healthy eating will never be such a hassle. Plus, you’ll get more uniformly cut ingredients that not only give a professional look to your dish but also help them to cook evenly as well. This mandolin slicer is adjustable with a knob control on the side. Whether you are going for a 1 or 9mm thickness or anywhere in between, the Mueller Austria V-Pro Mandoline Slicer fetches you the uniform thickness needed for your preparations to look pro. Whether you’re looking to prepare salads, veggie chips, cheese board spreads, or expertly cut potato gratin, the Mueller Austria V-Pro Mandoline Slicer is cut up for the job. It is equipped with five kinds of blades: the slicer blade, wavy blade, grater, shredder, and coarse shredder. The blades are made from German-engineered 420-grade hardened surgical stainless steel. And all five blades fit in the complimentary storage case. Worried about harmful chemicals leaching into your food? This mandoline slicer is made with 100% BPA-free, food-grade ABS plastic. The Mueller Austria V-Pro Mandoline Slicer comes with a slicing guard to protect your fingers as you work food or produce against the blades. Washing is as easy as operating this mandolin slicer. After using it, wash under the sink or pop them into the dishwasher. Do exercise care in working with the ultra-sharp blades. Pop each blade off with the use of a knife or any metal object that can be used to pry or wedge off the inserted blade. The blades are difficult to pry out and may cause injury if you use your bare fingers. This mandolin slicer comes with a slide control to fetch you thickness control and uniformity. Slice veggies, cheese, and more in three levels of thickness. The Prep Naturals Mandoline Food Slicer lets you cut, slice, and grate with its three interchangeable blades. You have the cheese grater, straight cut blade, and the julienne blade. This mandolin slicer comes with a slicing guard so that you can glide produce with ease and confidence. Alternatively, you can use the cut-resistant gloves that come with your purchase of the Prep Naturals Mandoline Food Slicer. And providing you enough resistance is the non-skid base of the mandoline slicer. 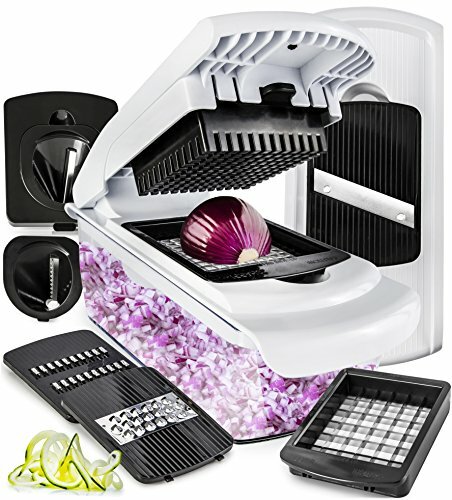 For stress-free and no-mess operation, the Prep Naturals Mandoline Food Slicer is designed with a 1.5-liter food catch container. Discouraged to take out kitchen devices because cleanup can be a pain? While made up of many parts, this mandoline slicer is dishwasher-safe. You can just pop it in the dishwasher after use! Alternatively, you can run it under the sink and use the bonus cleaning brush. 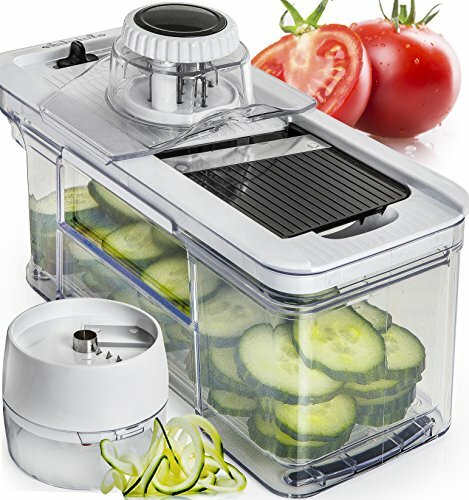 With the Prep Naturals Mandoline Food Slicer is a complimentary vegetable spiralizer that lets you cut in three settings—ribbon cut, julienne medium, and julienne thin. This mandoline slicer does not only handle your cutting, grating, and slicing needs, but it also helps you handle chopping tasks. Simply install the small or large dice blade on the board. Put the halved produce to be diced on top. Then, close the lid to push the onion, potato, or what have you through the dicing blade. And, you’re done in a pinch—or a press! The Fullstar Mandoline Slicer is equipped with seven interchangeable blades. You have the small and large dicing blades, straight-cut blade, cheese grater, spiral blade, ribbon blade, and a julienne blade. The razor-sharp blades are made with high-quality stainless steel. The Fullstar Mandoline Slicer comes with an FDA and LFGB certification. It’s also BPA-free. So, you can rest assured that you can trust the device to handle your food. This mandolin slicer comes with a 1.2-quart catch tray so that sliced or chopped ingredients are contained. Because the Fullstar Mandoline Slicer comes with razor-sharp blades, it’s important that you use its molded finger guard and a complementary pair of safety gloves. This mandolin slicer and chopper is also designed with a rubberized non-skid base so you can operate fast and easy. Catch tray makes preparation and cleanup easy. You have to cut the onion, potato or what have you into a smaller, manageable size for the dicing blade. 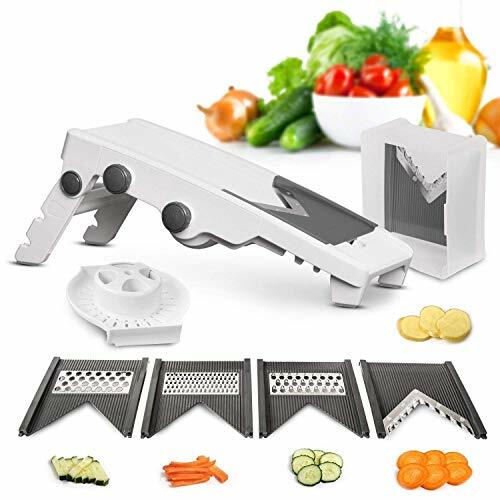 Any of the three products makes for the best mandoline slicer. Each of them displays different strengths. If you’re looking for one with great adjustability, then the Mueller Austria V-Pro Mandoline Slicer that lets you slice from 1-9mm is what you need. And it’s generously supplied with five different blades. You should be okay, however, with the fact that it doesn’t come with a catching tray if you go with this one. If a catching tray that makes preparation and cleanup is an important feature for you, then you’ll find your match in either the Fullstar Mandoline Slicer and Chopper or the Prep Naturals Mandoline Food Slicer. With the former, you can do more than just slice, julienne, or grate; you can even chop ingredients—including the notorious onions. However, it’s important to note that this one doesn’t come with a basic wavy blade. As for the Prep Naturals Mandoline Food Slicer, it affords you adjustable thickness and a good number of cutting options—three from the mandolin slicer itself and another three from the bonus spiralizer. While it does offer the more complicated cuts, the more basic wavy blade is absent.